and mind their own business." Control of bears is possible without killing. We work to protect both bears and people by preventing unwanted encounters and promoting nonlethal methods for handling bears. When bears come out of their winter sleep they are serious about quickly consuming calories. This is often the time when conflict occurs between people and bears. 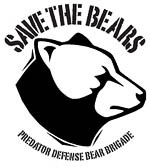 Every spring and summer Predator Defense receives calls from people who live in bear country who have inadvertently created food sources such as birdseed, garden compost, pet food left outdoors, and unsecured garbage containers. In most situations we can direct people over the phone how to eliminate the food source. In some situations, however, we go in the field and help people by showing them how to make their residence less inviting to bears. On occasion we have driven bears off by using loud noises. Once food sources are not available, bears almost always move on. For helpful hints on how to avoid encounters while in bear country—including planning for your trip, setting up camp, storing food, and handling encounters should they happen —see our handy guide called, "How to Avoid Bear Encounters: Respect Bears in Their Home."